I love holidays traditions. When I think about the holidays growing up I don’t think about a certain present that I got one year or what we ate that other year. But I do remember being with my family and the traditions that we did every year. We haven’t had many Thanksgivings by ourselves, so we haven’t had a chance to really come up with traditions for our own little family. A couple years ago I made everyone a fun personalized place mat. I decided that it’s time to start adding to our place settings. So I let everyone make their own plate. And as the years go on, we will add to the place settings. This year we made the dinner plates, next year maybe we will make a cup and the following year a dessert plate. And then we will continue to use them over and over again. It was a really fun activity for my kids and they had a blast. The plates turned out so good and cute. I loved it so much that I think we are going to do it for Christmas too! 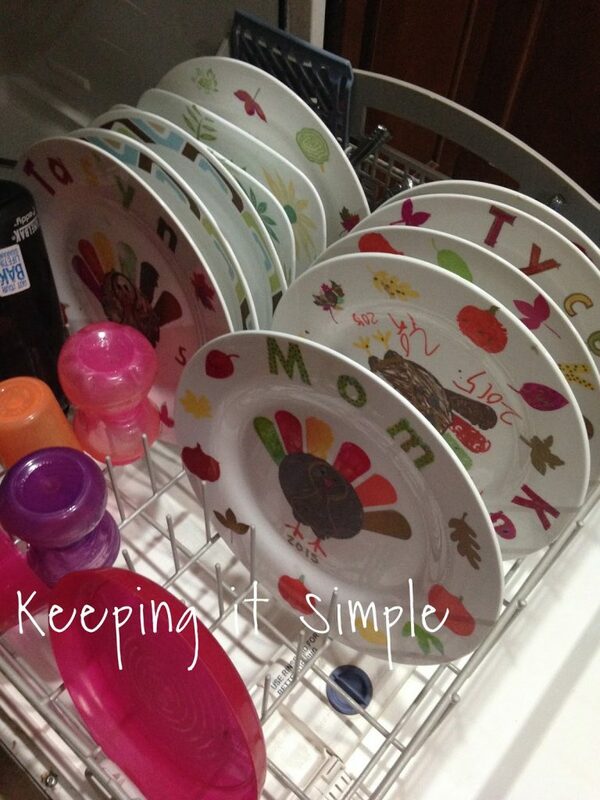 We used the plates this Thanksgiving and put the food directly onto the plate and then hand washed them. They did fine but because I want these to last I plan on getting clear glass plates to put over these plates, so they are still fun and festive but they will last longer. We took a regular white plate (I got it at the dollar store) and then I cut out the designs out of vinyl with my Silhouette. Instead of taking off the outside of the vinyl like you usually do, I took out the image, leaving a stencil made from vinyl. I used regular vinyl for this but stencil vinyl would be the best. Then using transfer paper, I put the vinyl onto the plate. The transfer paper just keeps the vinyl shape in tact so when you put it on the plate it is in the same place. Make sure when they vinyl overlaps it doesn’t go over the design that is cut of the vinyl (the part that you are going to color in).. This was the fun part, I let the kids do whatever they wanted to do. I helped put the vinyl on and then let them go at it. The markers make it super easy to color them nicely. Put the plate into a cold oven and turn it on to 400* and bake it for 20 minutes. The longer you bake it the darker the colors will be. After I baked it, I let it cool and then I put on the vinyl for the face. We just drew an outline for the head and then drew on the face. I took off the vinyl and then baked it again. I put it into a cold oven and turn it to 400* and it in there for only 10 minutes. When the oven was hot, I only put them in for about 6-7 minutes. And that’s it! Here are all of the kids’ designs. They did such a great job doing it and they had so much fun! They can’t wait to eat dinner on their plates. I am excited to put these onto our place mats. My husband did a different take on the design and I think it looks really cool, his might be my favorite of all of them! I have had several people ask if these can be washed and YES THEY CAN!! I did something similar to this a year ago and the cups are still going strong. Plus I made a Santa plate last week and put it into the dishwasher and it looks fine too. It is food safe and won’t wash off, as long as you bake the paint into the plate. I ran the plates through the dishwasher today and they did just fine! I would recommend light use (so for the holidays and that’s about it, and possibly hand wash). If you have a heated dry in the dishwasher it may mess up the coloring of the paint. I would recommend hand washing, even though they can go into the dishwasher, I think that they will last longer that way :). Here are ones that I made for Christmas. This post contains affilaite links. When u say "Then using transfer paper, I put the vinyl onto the plate. Make sure when they vinyl overlaps it doesn't go over the design" what does that mean or how do u do it? What does the transfer paper do? Can I ask what kind of paint markers you used on this? Can you tell me what kind of paint markers you used? LOVE these! love the idea! what makers did you use and are they save to eat off? how would you wash them as not to remove the makers? SUCH a cute idea! I love all of them – but I agree, your husband's is awesome!